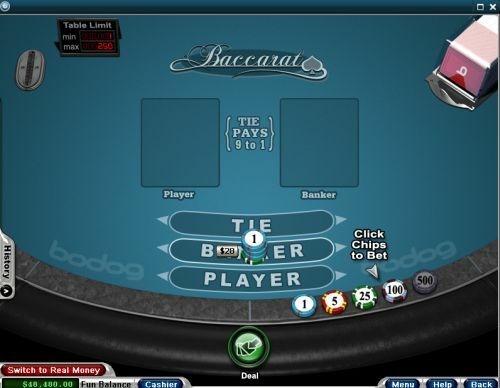 How To Play Baccarat Online - Casino Answers! The names Dan. Dealer Dan. And I like my drinks shaken, not stirred. Actually I like them stirred. But that’s because I’m a rum and coke drinker. Unfortunately, I’m not classy enough to play Baccarat. Thankfully that doesn’t matter when it comes to an online casino. I mean have you sat down at a Baccarat table in a live casino? It’s weird. Most people there actually DO think they are James Bond, requesting their vodka martini be shaken, not stirred. And that’s why I love online baccarat – because I sit there in my AC/DC t-shirt wearing my boxer shorts playing Baccarat and no-one cares. Anyway yes – online baccarat, and how to play it. Let’s get to that. 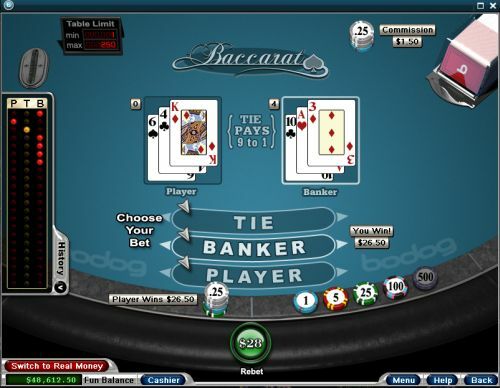 If you’ve ever played Baccarat before then you know it’s a very simple game to play. Online – it’s pretty much the same as at a live casino. There are no crazy variations or anything like that – it’s straight up Baccarat at every online casino. 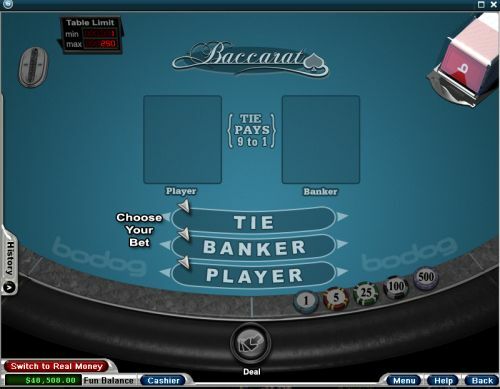 I’m going to be using the Baccarat game at the online casino Bovada. That’s because if you ARE a Baccarat player, then you might want to play there due to their VIP club which really suits the high rollers, and really suits the high rolling Baccarat player. So the first thing you do here is click which option you want to bet. If you want to bet on the Tie then you click “Tie”, and click “Banker” or “Player” if you want to bet on those options. After clicking – you then choose how many chips you want to bet. If you want to bet a different number than the ones set out then you add them up as if you were at a casino. So if you want to bet $28, you’d choose a $25 chip then 3 $1 chips. Got it? Nice and easy. So that way there’s no confusion or anything like that about how much you bet, or what you bet. And then it automatically does everything for you. Each hand takes just a few seconds and at the end of it, it tells you the Bankers score and the Players score, and then if you win it tells you how much you won. It also lists the commission at the top. As you can see – it will display the history with a coloured icon showing if the player won, banker won or it was a tie. And that’s it – that’s how you play online Baccarat. Very simple to play. Head on over to Bovada now to try it out for free. 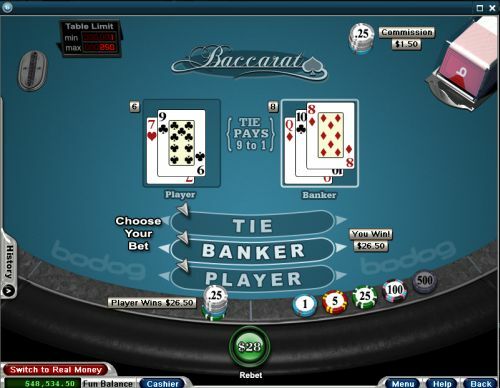 How do you play baccarat online? Where can I learn baccarat online?